The Shogun is back in the Confessional Arc! And as always, he's the centre of attention and the reason why Gintoki and co get into a mess. This time it's because drunkards go to Tama to confess their sins and ask if they will be forgiven. Gintoki overhears a few and decides to make a business out of it. But this takes a comedic turn for the worse for him as the "anonymous" people who come to Tama tell of an incident involving the possible death of the Shogun. Starting off with the usual bunch we see, Gintoki learns of something which started in his home regarding the Shogun. As more people come to the confession booth to tell Tama their side to what has happened, Gintoki tries to contribute to keep things under wraps, but fails miserably. Eventually he's arrested for the crime, only for us to find out the Shogun is still alive! 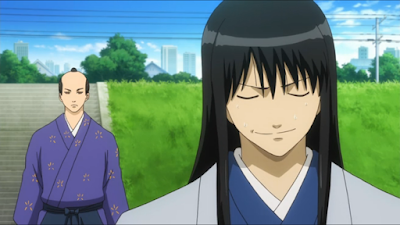 He's suffering from amnesia and is taken in by Katsura out of all people. Katsura has his own motives and tells the Shogun (Katsura doesn't know he's the Shogun) he wants him to join the Joi Rebel group. At the Rebel hideout, the other members are watching Gintoki's arrest and saying he's one of them again, or something like that. Katsura brings the Shogun with him to the hideout, and the others try to tell him that his new friend is in fact the Shogun. Katsura doesn't buy it and instead tries to teach Shogun lessons on how to become a good leader as the other members watch on in secret, which totally backfires as the Shogun ends up teaching him much to Katsura's anger. Anyway Katsura eventually goes to save Gintoki from the castle but the Shogun shows up too with the Joi Rebels. He and Katsura then end up having a race to see who can kill the Princess with Gintoki behind and screaming at the Shogun for becoming an enemy in his own castle. They reach her room at the same time (during the race the Shogun ends up naked again), and the two discover that the Shogun got his memory back and knows who Katsura is. We also learn Katsura knows that the Shogun is the Shogun. The Shogun shows up again as we haven't seen him before as he teams up with the enemy. Gintoki's in the sidelines despite being held in prison for the supposed death of the Shogun, but I'm sure all is well in Gintama world. And Shogun appears before the long awaited (and now released) Shogun Assassination Arc. Clearly I have many episodes to watch before I get there, but I'm sure it's worth the wait. And now that I'm watching more Gintama episodes, the review for that Arc should be up soon!